"One of the most persistent images of Africa is that of a fragmented continent whose nation states originate from the Western “scramble” for colonies in the 19th century. 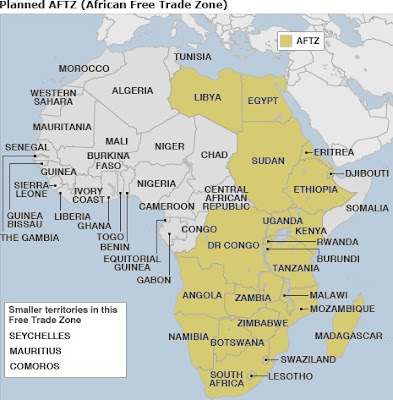 The recent initiation of negotiations for a Cape-to-Cairo Grand Free Trade Area will reposition Africa as a major player on the global trade scene. [...] This is a significant market, with a single economic space whose systemic benefits will be larger than the sum of the three regional economic communities. It will be more attractive to foreign investors and stimulate large-scale production that will in turn help to lower the price of manufactured goods." "Imperialist robber-baron Cecil John Rhodes was probably the first proponent of bringing Africa -- from the southern point of Cape Town to Egypt's Cairo in the north -- together under one flag. Of course, his was an imperial dream [...] A good many decades after Africa effectively put an end to Europe's Cape to Cairo dreams, the continent's leaders have embarked on a similar initiative, though for completely different reasons. On June 12, leaders from the SADC, COMESA and EAC blocs met in Johannesburg, South Africa to start putting in place the mechanisms that would be required to create a grand, unified trade system. This Tripartite Free Trade Area (T-FTA) will bring down trade barriers and create a massive single market with a GDP of US$1 trillion by 2013. " 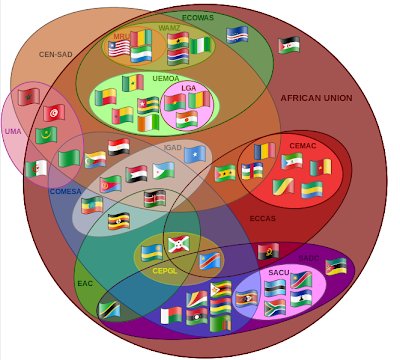 While very compelling, it's a bit troubling that there have been so many prior, ambitious attempts to build blocs of African intergovernmental organizations as this Euler diagram shows... How successful have these been and why is the "grand vision" going to work now?